Have you ever been blind? I have MS, and often times people ask me if I went blind in one eye (Optic Neuritis) as one of my symptoms. I didn’t. Over 55% of people with MS experience blindness from Optic Neuritis and often as their first symptom, but I didn’t have that at all. And I’m grateful. I think not being able to see with my eyes would be a major adjustment and extremely scary. 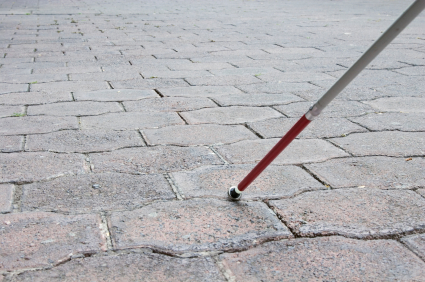 In the New Testament, we can find many instances where Jesus heals the blind. In those days to be blind meant you were at great risk. Everywhere you turned there were dangers. Even in your own house you would be in danger of touching an open flame. Jesus knew that being blind was an awful thing for these people. He had compassion on them and healed them. Those healed were grateful. They couldn’t help themselves from telling people they met. A lot of times the blind were also beggars at the gate of the city, so many would even recognize them and marvel at their healing. I enjoy reading about the healing of Blind Bartimaeus (Mark 10:46-52). Bartimaeus was not going to let Jesus pass by the gate without healing him. Bartimaeus was so sure that Jesus was who He said He was, that he was positive Jesus could and would heal him. He yelled out. He made a scene. He even got scolded, the scriptures even say “sternly”. He was so persistent and unwilling to be ignored or passed by that Jesus turned and told His disciples to call Bartimaeus over. I love what happens next. Bartimaeus throws off his coat and runs to where Jesus is. He can’t wait to see Jesus. Bartimaeus asks Jesus to make him see again. Jesus says to Bartimaeus that his faith had made him well, and Bartimaeus could see. But this story doesn’t end there. There is one more line in his story. When Bartimaeus was healed, he followed Jesus. Even though the closest I have come to being blind was being blindfolded, I do understand the second definition to blind. Sometimes we’re blind to the truth. We are unable or unwilling to discern or judge what is right in a certain situation. Sometimes our stubborn is because we are unable to see (blind) to the other persons situation. Is there someone you can’t or won’t try to see their perspective. It’s hard to fight this kind of blindness. It’s hard to get past old pain. God can heal this blindness too, and then our relationships have a chance to heal (even if you’re not in them anymore). There is an even more dangerous kind of blindness. Many people are blind to the love of the Lord. They can’t or won’t receive God’s love for what it is. They can’t see the light. They won’t let in the Holy Spirit and even try hard to keep all things about God far from them. Sometimes we allow things to blind us from the relationship the Lord wants to have with us. We allow our busy lives, self-centered ways and laziness pull us away from the Lord. We know that if we are in relationship with the Lord. If we open our eyes and see Jesus, our lives will change. Change can be scary. But Bartimaeus gives us a great example of how we should respond to the opening of our eyes. We need to run to Jesus and follow Him. Are you blind to God?